Part of my goal for these classes is to connect language to movement so that students have a kinetic language learning experience. Up, Down, and Around by Katherine Ayres was a great catalyst for just that. This story allowed us to explore movement of how things grow up, down, and around. For the reading of the book, I had the children sit on the rug. Because this book has predictable text, the preschool students were able to read along while acting out the movements with their arms. After the book, we played a movement game based on the text. Taking my cue from the book, I asked students questions like, "If you've tried corn, stand up!" and continued this with all the vegetables in the story and their corresponding movement, "If you've tried beets, sit down," "If you've tried tomatoes, turn around!" The children seemed to have a lot of fun with this and it was great to see them react to the different foods that were called out. 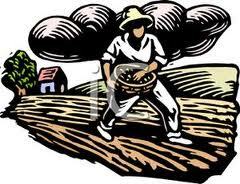 Years ago in an African dance class in Cambridge, Ma, I learned a seed planting dance. It is a dance that has stayed with me and has been incorporated into many of my creative movement classes. To transition to the seed planting dance, we discussed how each of the vegetables in the story began as seeds. We began by making a basket shape with one arm. With the other arm, we acted out removing the seeds and tossing them into the soil. Once we got that movement down, I continued the story of the dance. We carry the babies on our backs while we plant the seeds, so we have to bounce them to keep them happy. We combine the movements and I put on the music. Together, we planted seeds all around the room while bouncing the babies. Boy and girl alike enjoy performing this dance and it is such a pleasure to witness their jubilation! Back on the rug, we put the babies to bed for a nap and continued to free dance; a celebration for planting all the seeds. To end class we sat on the rug together and I asked each child what was their favorite fruit or vegetable and followed-up with a sticker. This was a nice way to cool down and end class as well as interact one-on-one with the children. At the end of my last class I was able to stay a little longer to converse with some of the children further. It was a wonderful dialogue of children telling me and each other all different kinds of fruits and vegetables they enjoyed, a wonderful way to end the class. 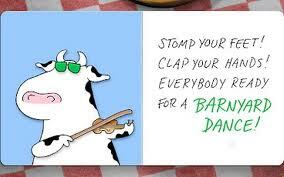 This week we read Barnyard Dance! by Sandra Boynton, a great book gushing with movement words. Because there were so many movement words, I decided to write them all on slips of paper and put them in a jar. 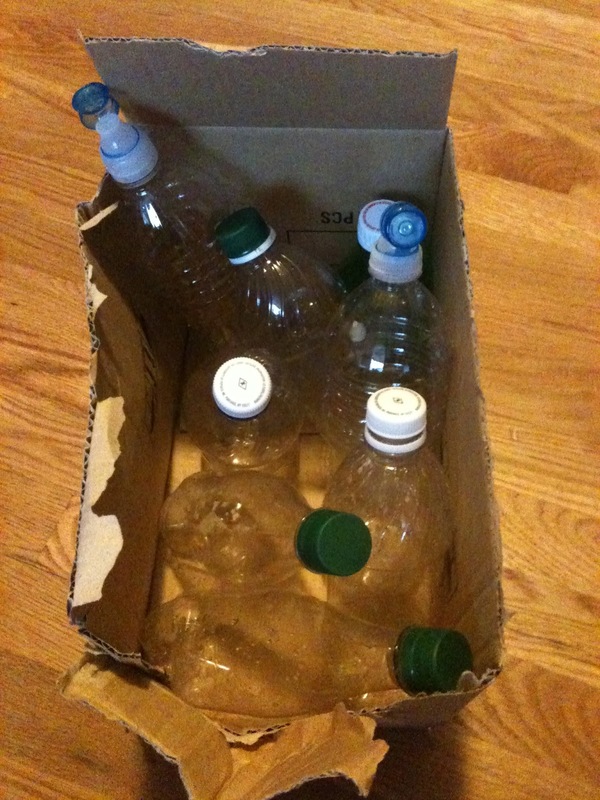 After the story, each student had a turn to draw from the jar and tell us what movement to do. 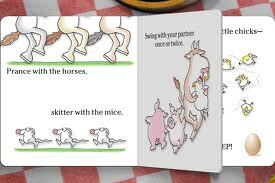 I used language straight out of the book like, twirl with the pig, bounce with the bunny, prance with the horses. The student would open the folded paper (a great fine motor challenge for this age group), I would read it aloud, and then the student would demonstrate the move for the group. Then, I would play the ukulele while all the children tried out the movement. After each student got a turn, we all went down to the hoedown. I encouraged students to incorporate any of the moves we tried, or be any animal from the story, or just dance how they like. We did this for a few minutes until I had all the children hold hands in a big circle. We ended the class by having each student enter the circle and show-off their favorite moves while the rest of the circle clapped and cheered. For the hoedown music, I played Bela Fleck and the Flecktones' Throw down at the Hoedown off their album Left of Cool- how could I not? That quick banjo playing funk style is perfect for these classes! Giraffes Can't Dance by Giles Andrea was the perfect lead-in to drumming and dancing this week for Story Story Dance. After our standard warm-up and the story, I brought out the djembe. Students explored various types of movement as I played. I encouraged them to use their whole bodies to move with the drum. In my experience, children have no hang-ups when it comes to embodying the sounds of the drum, they are fearless and go for it. For the next part of the class, I told the children that now they would be the drummers and the dancers. One by one I introduced them to a variety of percussion instruments and showed them how to play it. 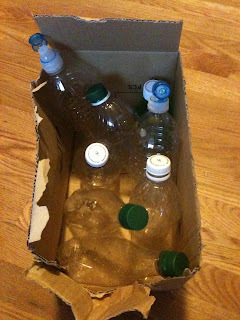 This included three homemade shaker drums two frog drums, a rain stick, a gecko clacker, and tone block. The frog drums invited us to have a great discussion about same and different. One of the frogs was small and yellowish, the other was bigger and very dark brown. We also listened closely to the sounds they made to determine if their sounds were the same or different. Then, we counted all the instruments to see how many we had all together. 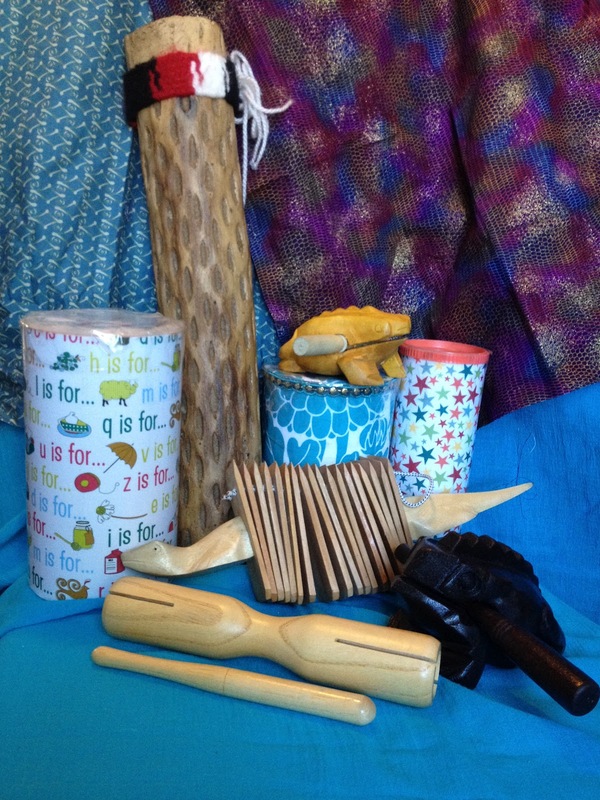 Music and instruments invite so much opportunity for children to show what they know and make connections across the curriculum. For the drumming dance party, I broke the class up in half by inviting students up to play the instruments while the others danced, then switched. Once the drummers had their instruments, we reviewed two hand signals - start and stop. If you have never been a part of a drum circle, I cannot in words describe the excitement that occurs when all the drummers are playing and then all stop together. There is something magical in that moment when everyone stops at the same time. My little drummers got to experience this yesterday and the magic was definitely there. I ended class by giving everyone a turn to come up to the djembe and play it. This is always a fun activity because everyone gets to have their moment to hear themselves on the drum. Some children hit as hard as they can, some play a little quiet, some give it one big whack then walk away, while others take a moment to find a rhythm. 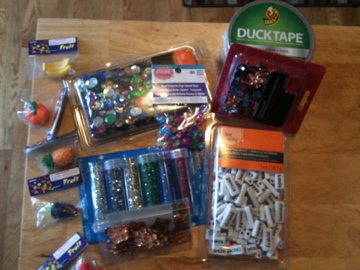 So much fun and so much learning! After two months on hiatus from foot surgery, I am finally back in the classroom! 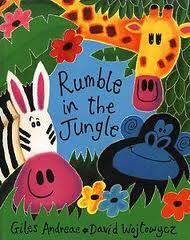 This week, I kicked off Story Story Dance with animal masks and the book Rumble in the Jungle by Giles Andreae. 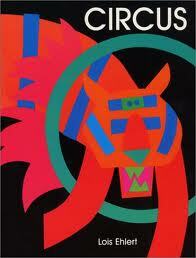 This book introduces many different animals, but I focused on the ones that I actually had masks for. This worked out great because if I had done all the animals, this would have been an hour long class. As it was, this class went over my allotted half-hour slot and took about forty-five minutes. Luckily, the teachers were great and happy for the extended class considering the kiddos would have shortened outside time due to the heat. Sometimes things just work out. The masks were very simple, made out of animal face paper plates from the super market and tongue depressors for holding. I got this idea from a yoga teacher I worked with who used the plates in her children's yoga class to help children embody animal poses. For this class, I read the short poems about each animal from the story and students explored smaller movements in their sitting positions. After the story, we created a big circle with movement space in the center. Every student was given a mask and each animal had their own music. I used short musical compositions from a pre-ballet music selection. In partners, students came to the center of the circle and explored the larger animal movement. As always, the children surprise me. The children seemed to love taking their masks and scaring the children in the outer circle and the children in the outer circle seemed to love getting scared! After every set of animals had a turn in the center, we went to the animal dance party, where all the animals dance together and the children become any animal they want to be. In the beginning of the story, the narrator introduces the animals as waking up in the jungle and the end of the story, the animals go to sleep. So of course we ended class with all the animals falling asleep in the jungle. The fake snoring was hilarious! I traded masks for stickers and ended class. It's great to be back!